In Welsh folklore the Gwrach y Rhibyn was something between a fairy, a warning and a vampire. She was usually seen at crossroads in the form of an old hag, weaving and bobbing on her tattered shawl, as if waiting to attack someone that passed by. At other times though, she was spotted besides rivers or by secluded forest pools. In in other versions of the tale, she appears as a ball of light, like a candle flame, drifting quietly between houses late at night. The myth of the Gwrach y Rhibyn tends to mix with other Welsh notions, like the Canwyll Corph, or corpse candle. This phenomenon appears as a globe of bluish white light or a flickering flame and was usually seen around graveyards or places where people died. 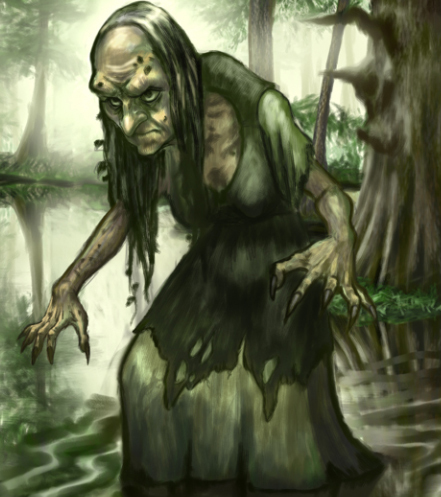 These corpse candles are regarded as harbingers of doom, but they are also associated with evil and darkness, so it makes sense for the hag to be connected to them. Besides warning folks of impending death (sometimes by wailing like a banshee), the Gwrach y Rhibyn was also believed to attack people as they slept. The old hag was especially fond of small children, whose blood she drank, usually in small measure, leaving them pale and sickly. If a baby wasnât growing strong and healthy, it was common for people to blame it on the hag. In some descriptions she looks like an evil old crone whose mouth is cake in dried blood – the blood of innocents. Itâs not clear as to how she drank the blood, the myth varies a bit saying sometimes that she drank it through her hallow teeth (or one hallow gobber tooth), others say with a long barbed tongue. None are sure the exact method, but they do know she always drank blood in small quantities, returning often to do so and allowing the victim to slowly deteriorate as if from disease. Other than attacking children, she also feed upon the old who were bedridden, probably because they couldnât defend themselves from her advances. Her favorite time to attack children and adults was late and night during the full moon. There are countless tales spread all throughout rural areas in Wales of travelers being attacked by Gwrach y Rhibyn. The only known way of freeing yourself from her was to use physical force. As time went on, the vampiric elements of Gwrach y Rhibyn were forgotten and she became more of a Welsh banshee than anything else. But old tales still tell of her wicked blood drinking. Crazy Vampire News This Month!